The suspended advocate says Agrizzi’s ‘revelations’ about him were lies. 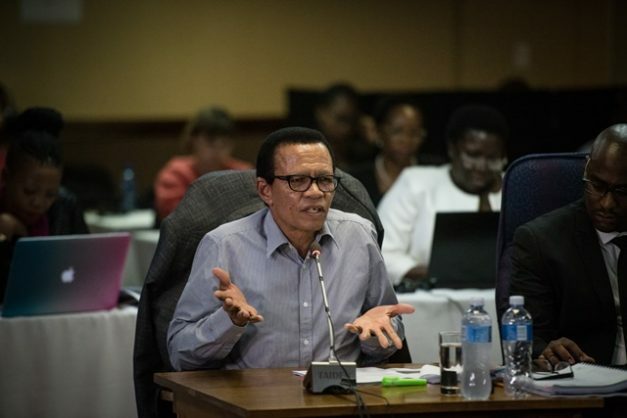 Suspended special director of public prosecutions and head of the National Prosecuting Authority’s (NPA) special commercial crime unit advocate Lawrence Mrwebi took the stand yesterday at the Mokgoro inquiry probing his and Nomgcobo Jiba’s fitness to hold office. Mrwebi is fighting claims he had been ineffectual in his post. ‘Snail’ was the code word assigned to Mrwebi by former national commissioner of correctional services Linda Mti in 2009, Bosasa whistleblower Angelo Agrizzi told the Commission of Inquiry into State Capture chaired by Raymond Zondo. Agrizzi claimed Mti met weekly with Jiba, the suspended deputy national director of public prosecutions, and Mrwebi, and they would provide updates of the investigation into Bosasa. In return, Jiba would be paid R100,000 a month and Mrwebi R10,000. Agrizzi named a third person, Jackie Lepinka, Mti’s private secretary before going to the NPA. According to Mrwebi, Lepinka arranged meetings and took minutes and documents would be sent to her, never directly to Jiba, who was then the acting national director of public prosecutions. Mrwebi denied receiving money from anyone at Bosasa. He noted at the beginning of his testimony it was after he refused to pay an informant as KwaZulu-Natal head of the Scorpions in 2003 that his troubles began. According to him, the Scorpions had “confidential funds” to pay informants. However, that informant was apparently still involved in crime. When it came to the prosecution of Crime Intelligence head Richard Mdluli, Mrwebi said his decision to withdraw the charges due to insufficient evidence was based on what he saw at the time. Jiba is expected to take the stand today.